Grams per Liter | Are You Talking About Concentration or Density? Why do we say grams per liter? Everything on earth has a density. And we measure density in grams per liter (g/L) or other units of mass per unit volume. One gram is about the mass of a paper clip, or one third of a sugar cube and a litre is approximately the same as a quart. A litre of air at sea level has a mass of about one gram, and less at higher elevations. A litre of water contains about 1000 grams, a kilogram. 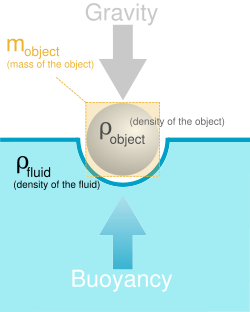 These examples show you a bit about density, also called specific gravity. Here are some more. Wood varies from about 200 to over 1000 grams per liter. If it's less than a thousand, it floats in water. Ice is usually 920 grams per litre. It floats. Metals are very heavy. They vary from 2700 for aluminum to over 19,000 for gold, with average metals such as copper and steel in the 8000 to 10000 range. Rocks are quite dense too, with most coming in around 2500 to 3000 g/litre. Same goes for glass, which is made from rocks. The density for most liquids and solid objects depend a bit on the temperature of each one, as most things expand when heated and each one would get bigger without changing its mass. For gases, density changes very much with the pressure as well as temperature. Basic thermodynamics says that compressing a gas into half of its original volume will double its density. It will also increase in temperature and pressure. By how much? Well, that's harder to calculate than the change in the grams per liter. And what is the density of gasoline? This stuff is a mixture of over 100 hydrocarbons and minerals, each with its own density. Every tank could have its own mix of these things, making the density a little different every time. Most petrol, as it is sometimes called, ranges from 700 to 800 grams per liter. I use this free utility website for nearly all my unit conversions: OnlineConversion.com Convert just about anything to anything else. Select "density" to see all the options. Play with it a bit and see if it helps you. Concentrations are really densities, or is density really a concentration. Both are ways of expressing the amount of something spread out within a certain volume. But in this case, the rest of that volume is filled with a solvent, some other substance such as water or air molecules. We use grams per liter to indicate both concentration and density at times, and quite interchangeably. If you were to take your sugar cube, three grams, and dissolve it in one litre of water by mixing it really well, you end up with a sugar concentration of three g/L. You should be able to taste that. How does concentration differ from density. This concept of concentration implies that the sugar is distributed quite evenly thoughout the entire liter. That depends on some degree on the solvent used. The water, in this case, needs to hold the tiny sugar particles off the ground, the bottom of the container, and air might not do that so well. Sugar powder would slowly settle out. On the other hand, gases in the air do not settle. Carbon dioxide or water vapour, for instance, can stay in the atmosphere indefinitely, until removed by some other mechanism such as plants or condensation. Concentrations are also given in terms of a fraction of the total mass or volume of the solvent (air or water) in a space. So you sometimes hear percent (%), parts per million (ppm) or even parts per billion (ppb). The concentration tells you how strong a vapour is, what the humidity, the density of water vapor, is outside or how salty the ocean is. One important exception to note, though, is relative humidity. Though given as a percent, it is not the percentage of the total volume occupied by water vapor in this case. It is instead the fraction of the concentration as compared the total concentration (vapour pressures to be technical) that can remain in the parcel of air under the present conditions of temperature and pressure. The concept of relative concentrations is what helps us make recipies with the proper proportions of sugar, flour and whatnot, determine how strong an alcoholic drink is or whether you have too much in your blood (another solvent) to drive and measure whether fumes are strong enough to have become mortally poisonous or explosive. The SI, Système International unit for density is kilogram per cubic metre, which happens to be equal to grams per liter. This system was invented by the French, which is why the official spelling is grams per litre. The same goes for metre. How concentrations of substances are written: percent, parts per million or grams per litre whether you use air or water. These units work for density too.